Guest post by our marketing intern Mitch Pederson. When he's not busy working at the AltRider office, Mitch spends his time riding, fixing and even building motorcycles. While we dream of always riding off-road on awesome trails, most of us can admit that we use our bikes mostly for in-town travel. 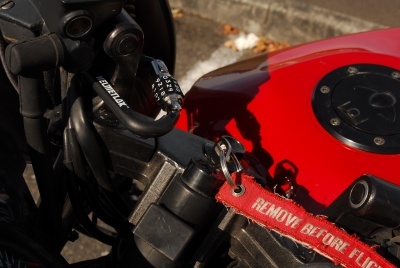 According to the National Insurance Crime Bureau over 46,000 motorcycles were stolen in the U.S. in 2011 alone, but there’s more to think about than someone stealing your whole bike. It can be a headache securing your gear while you run into the grocery store, mall, barber shop or wherever your stop may be. While many people leave their helmet hanging on the handlebars, it’s daunting to think about the idea of being stranded because somebody walked off with the helmet. The other option is to carry your gear inside, but that can be tough when trying to juggle a shopping basket. Many bikes have a built in helmet lock somewhere on the frame, but often it is in an inconvenient or impractical location. My Kawasaki EX250 has a lock that leaves the helmet resting on the exhaust muffler. 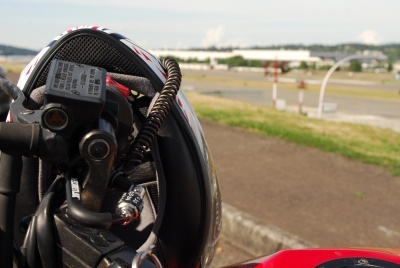 By design, you can’t lock your helmet to the bike until the exhaust has had time to cool. Needless to say, this isn’t exactly convenient for quick trips to the store. I recently picked up a HelmetLok™ to test it out on my bike. 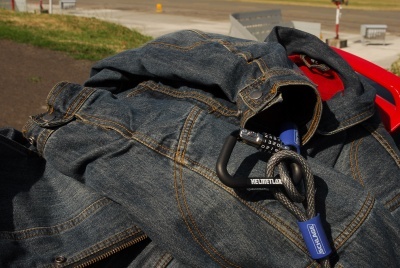 It’s a carabiner-style lock with a soft coating to protect your bike against scratches. Set your own code in the 4 digit combination lock so you can make it something easy to remember-- no keys are required. The HelmetLok ™ can be anchored to your handlebars or any other solid part of the frame, allowing you to secure your helmet. Set-up was simple and straightforward; open the package, set your combo, lock it up. The lock itself is very sturdy, while the protective coating means you won’t scratch your bike up using it. The opening allows for up to 1.5” (38.1 mm) handlebars, and slipping the lock through the D-ring on most helmets is easy enough. On my EX250, there wasn’t a way to lock it to the handlebars and through the D-ring because of the jumble of cables in the way. 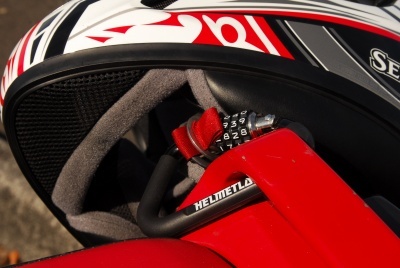 HelmetLok™ also offers a vinyl coated cable that you can use to extend the reach of the lock. The cable coils up neatly and has loops on each end that hook to the carabiner. Looping the cable through my helmet allowed me to leave it hanging securely on the handlebars. Another option is to secure the HelmetLok™ to the body of the motorcycle. I locked mine to a handle behind the seat. This allowed me to anchor my helmet using just the carabiner itself. One thing I noticed is that although the majority of the HelmetLok™ is covered in a protective coating, the lock mechanism itself is not. You’ll want to make sure the combination cylinder isn’t resting on anything that might get scratched. I thought about leaving the HelmetLok™ attached to my bike all the time, but with wind and vibration the unprotected part will mar whatever it’s attached to. Carrying a jacket around when it’s 95 degrees outside is also really inconvenient, but with a bit of ingenuity, the HelmetLok™ helped solve that problem as well. I picked up a short bicycle cable from the hardware store. By threading the cable through my helmet and the sleeves on the jacket, I can lock them both to the bike and not worry about someone walking off with them. Obviously you don’t want to leave anything valuable in your pockets. The HelmetLok™ is a quality product that’s easy to use and works well. Many of you may wonder if a $27 dollar lock will really deter the thieves from stealing gear off your bike -- I probably wouldn’t leave my helmet and jacket sitting out overnight but it makes a great accessory for running around town.